For better or worse, 2008 has become an economic market, not unlike the Great Depression, the economic malaise of the 1970s, and Black Monday in 1987. The near meltdown of the U.S. economy in 2008, followed by years of high unemployment and ongoing global unease, continues to affect businesses of all sizes today. Any notion of a sustainable "recovery" is mixed at best. Largely left out of the headlines and political debate are the unique effects this has had on midsized business owners. 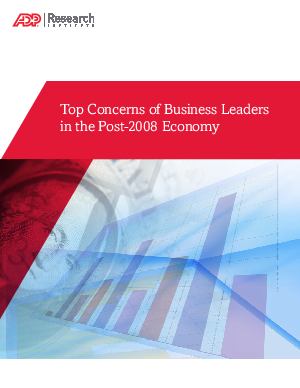 To gain insight into the specific concerns of midsized business owners today versus four years ago, and looking ahead, the ADP Research Institute, a specialized group within ADP, conducted an online survey in 2012, in which 507 business owners, C-suite executives, and senior level executives in U.S. organizations with 50-999 employees shared their perceptions of the state of the economy, identified their top business concerns, and provided a glimpse of the key challenges midsized businesses face moving forward.